This is such a great dish to use pesto. Essentially, it's pesto, pasta and chicken tossed with spinach, tomatoes and topped with goat cheese. The sun-dried tomato really has a beautiful color and the rich flavor of tomato comes through nicely. 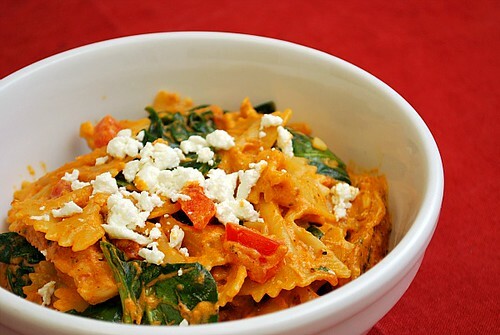 I adapted the original recipe to include chicken, spinach, fresh tomato and goat cheese because they all work so well with a tomato pesto. It's a great combination of flavors and they make for delicious leftovers too... that is, if you have any after serving it the first time! Add the pasta to the pesto, grilled chicken, spinach and diced tomato. Toss to coat, adding enough reserved cooking liquid to moisten. Season the pasta, to taste, with salt and pepper. Serve with crumbled goat cheese on top. I need to make this! It looks super yummy! I have extra roasted red peppers from the other day, do you think they would be good tossed in? Sweet! Thanks, Joelen! I can't wait to try this. Wish I lived closer to Chicago! This looks so good! I buy sundried tomatoes all the time, but I never do anything more with them than throw them on a salad.